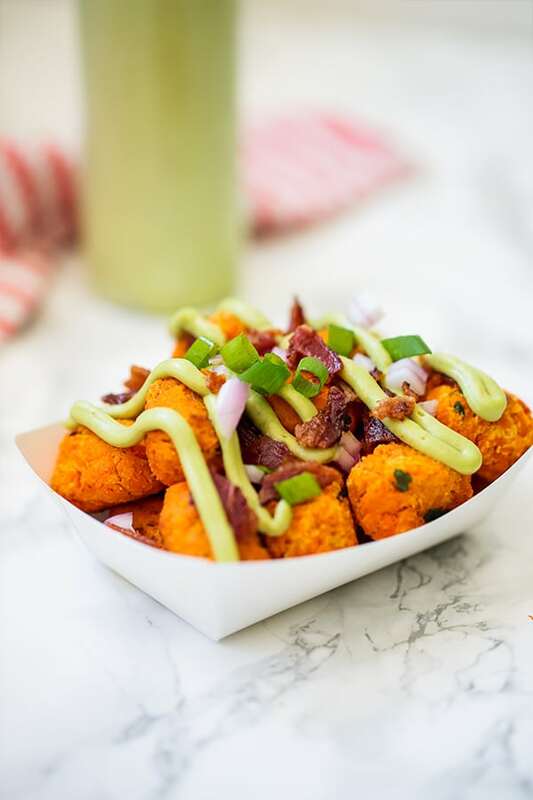 These loaded sweet potato tater tots are the ultimate healthier junk food! They’re made with real food paleo ingredients, but taste like they’re straight off of a food truck. There’s something about summertime that always has us craving that nostalgic ballpark-style food! Something salty, unique, and reminiscent of what you would get from a food truck. Chili cheese dogs, messy nachos, and cheese fries come to mind. Drooling yet? Me too! Well, not so much when I’m reminded that those traditional ballpark snacks are mostly made with canola oil, soybean oil, enriched flour, factory farmed meats and so many ingredients that you can’t even pronounce! No thanks. Well, how about we make it with all real food? 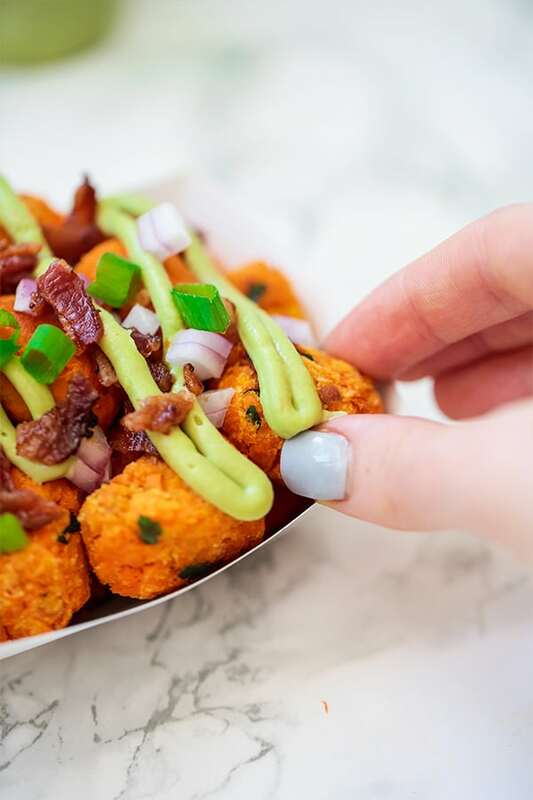 That’s exactly where these Loaded Sweet Potato Tater Tots come in! 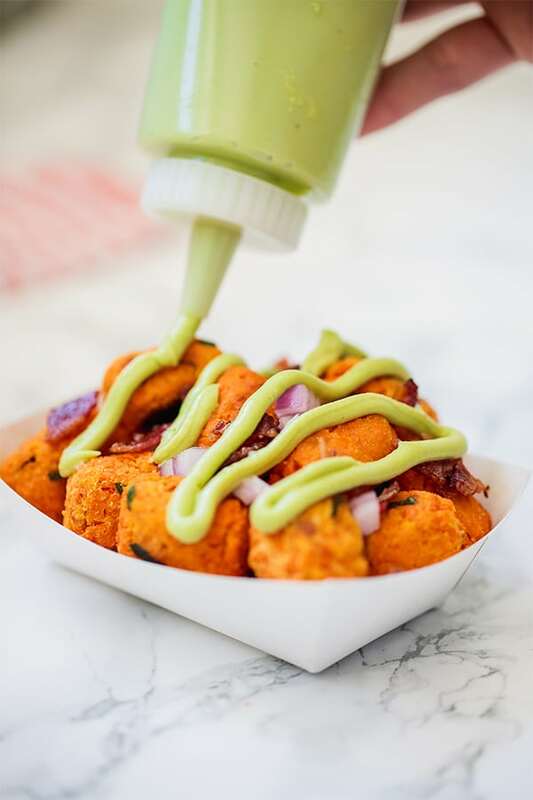 This tasty side dish is made with homemade sweet potato tater tots, an avocado crema, bacon, and fresh herbs. It’s the kind of messy, yummy food that I thought I would never be able to enjoy again… but here they are! 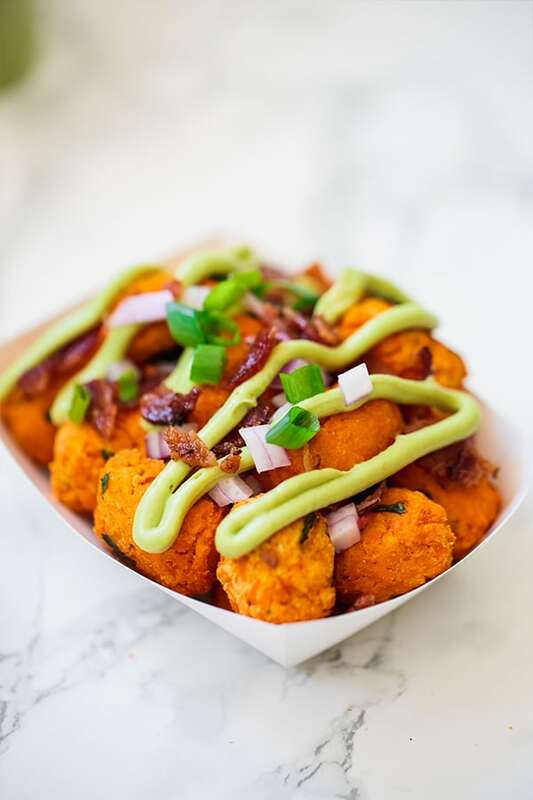 You can find the whole a recipe for sweet potato tater tots here. It’s easy to make from real food and is simply baked in the oven. This makes the avocado crema! You can use this same avocado crema for my bang bang cauliflower tacos as well. Getting a local pasture raised bacon or a high-quality nitrate free bacon is what I recommend. For some added veggies and flavor. First, prepare the avocado crema by combining all of the ingredients in a blender and blending until smooth. Add 1-2 tbsp more of avocado oil if it’s too thick to blend. Add the crema to a squeeze bottle or a piping bag. Set aside. Assemble the loaded tots, starting with the tater tots first and then layering on the bacon. Add the avocado crema and finish with the onions. Serve fresh with extra crema on the side and enjoy! I used turkey sausage because that’s all I had on hand. Cooked the sausage with diced up mushrooms and some chopped garlic. For the sauce, I followed instructions except used the juice of a whole lime and added a few tablespoons of Sriracha. This was way yummier than I thought it would be.